I had heard about Cafe Degan in Petitenget and was curious to try what was supposed to be Bali’s best Thai food so on a weekday, a friend and I had lunch there to taste if the restaurant lived up to its reputation. We arrived at around 12:30 on a Wednesday and were the only customers there so after choosing a table further back and close to several electric fans. Cafe Degan is a joglo, an antique wooden Javanese house, simply decorated with antique hanging lamps. We settled in and ordered something cold on that hot and humid day – Javanese iced tea for me, which was available in a glass or a pitcher and came (surprise, surprise!) with iced tea cubes and a fresh fruit juice for J. The menu at Cafe Degan is split into two – Javanese favorites and Thai favorites because the Javanese chef used to work at the Banyan Tree in Thailand before coming back to Indonesia and setting up his own restaurant about a year ago. Since we had heard so much about the Thai food and also because there really isn’t a proper Thai restaurant in Bali, we were eager to try dishes from the Thai section of the menu. After we ordered, several more customers walked in for lunch but most tables had chosen dishes from the Javanese side of the menu. We both chose typical Thai salads to start. I had the Yum Pla Foo – green apple salad while J had the green mango salad. My salad was delicious – a perfect mix of Thai flavors: sweet from the green apples, sour from the lime juice, salty from the fish sauce, spicy from the bits of chili with the added texture crunch from the crispy catfish pieces, roasted peanuts and fresh cilantro. J‘s salad looked similar to mine except it used green mango instead of green apple. Main courses were a typical Thai green curry of chicken which came steaming hot, creamy with coconut milk and loaded with chunks of chicken and baby vegetables which was much spicier than the salad so I had several servings of steamed jasmine rice with it. J opted for the Tom Yum Goong, the classic Thai lemongrass-flavored hot and spicy clear soup with prawns. For dessert, we thought we’d have an exotic Thai fruit dessert but their list, surprisingly, had a few Indonesian desserts and many other Western ones. We didn’t understand why until we realized that the whole front area of Cafe Degan is actually a pastry shop specializing in wonderful-looking cupcakes, cakes and pastries. 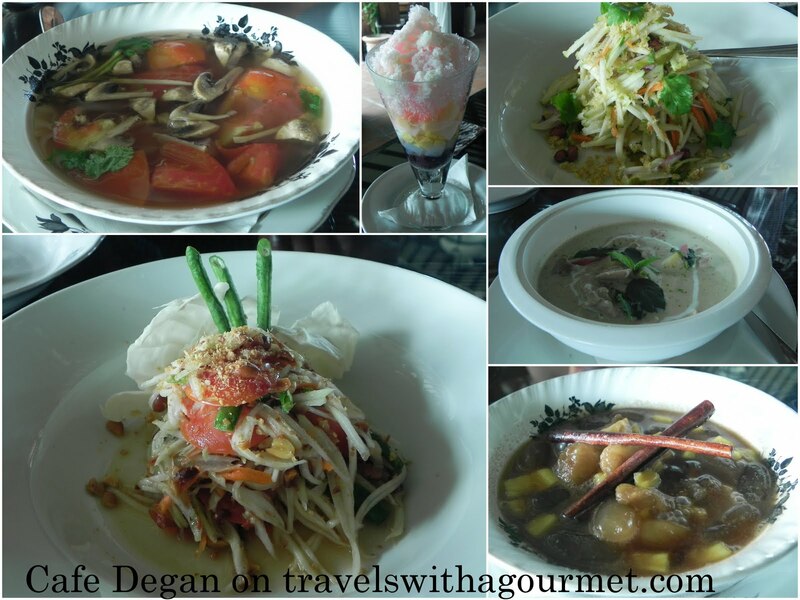 J had the Es Degan – the crushed ice and coconut milk dessert mixed with fruit, red beans and jelly while I had a cooked banana dessert which came unexpectedly piping hot and was served in a bowl of palm sugar syrup and chunks of jack fruit. It was so hot that I asked for another glass of crushed ice and added that onto my bowl so I could cool down my dessert. Cafe Degan is a homey place where one can get both authentic Javanese and Thai dishes. Although the concept is a bit mixed-up (Javanese, Thai and cupcakes? ), I have to admit that the Thai dishes were quite good and is probably the best I’ve had here in Bali. *Open every day except Wednesday from noon till late. Cafe Degan has the best Thai food on the island. Send me the link when you post it. I’m curious to read what you thought about it. Hi there, stumbled upon your blog while getting ready to write my own entry on Cafe Degan. The food was absolutely lovely, though I never new it was a joglo – will have to include that (with link to your blog, of course). Happy eating!